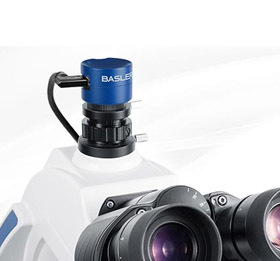 Find Big Discoveries in the Smallest Details – with Basler’s PowerPack for Microscopy. Thanks to Basler’s new PowerPack concept, you can now tailor your camera system without compromises. In every implementation of a microscopy application, your system’s requirements are very individual and so are your expectations. Benefit from Basler’s high-quality cameras with all necessary components at your fingertips for a comfortable system set-up and easy installation. Rely on precise and reliable imaging, as well as on professional software for image acquisition and analysis.